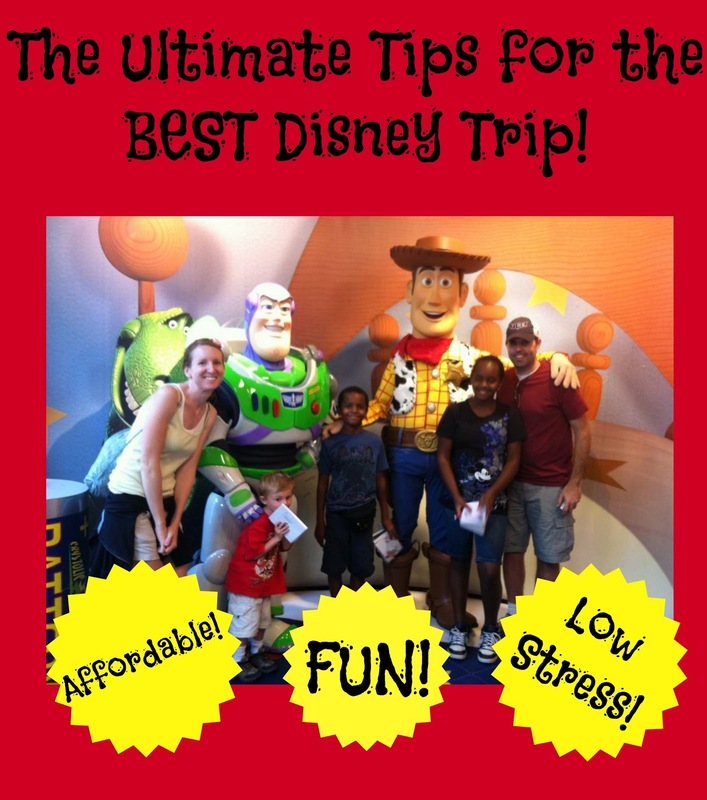 Literacy Launchpad: The Ultimate Tips for a Magical and Affordable Disney Trip! Summer is swiftly approaching, and that means vacation time! We took an amazing trip to Disney World last summer, and I think a big reason it was so amazing was because I did TONS of research before we went. In true Literacy Launchpad style I read every Disney World planning book I could get my hands on from the library. My research paid off. Yay for books! We didn't spend a ton of money, pretty much didn't wait in ANY long lines, saw everything we wanted to see, truly enjoyed ourselves, and came back with family memories we'll forever cherish (Aww!). AND we were there during one of the busiest (and hottest) times of the year! Impossible you say? It's not! And I really, really wanted to share with you all some tips that made our trip so fantastic. I hope they help you too! Consider this off-topic post a public service to you, my lovely readers! Turtle Talk with Crush (Epcot) was one of our favorite things. Giggles all around. 2. Read some Disney Guide books. This made the anticipation of the trip that much more fun, and helped optimize our enjoyment of the trip. 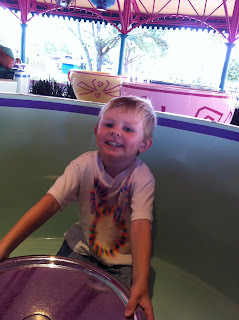 I learned the best times to get to the parks, the rides and attractions worth visiting and those not worth bothering with, what might scare my youngest and what he would love, the yummiest snacks to get while in the parks, how to avoid crowds, etc. You can find guidebooks at your local library or Amazon. This is the best one to read in my opinion! Dole Whips from Aloha Isle in Magic Kingdom - a must! I also did research online and found tips on what to pack for in the park, fun t-shirt ideas and things for us to make for our trip, fun and thrifty souvenir ideas, etc. I gathered some of these ideas on a Pinterest board HERE! 3. You can download software and/or apps to help minimize your wait time in lines, and to help maximize the number of rides and attractions your can make it to. We used touringplans.com, though we didn't end up following any specific touring plans. I had read enough books to know which rides to hit first, and which ones we wanted to make it to most, so we used the app to track wait times for the rides and attractions we wanted to make it to and created our own custom touring plan while we were on the go in the parks each day. In addition to the touringplans.com app, my husband put a Disney World app on his phone that helped us track where the characters were at in the park each day. It also included maps and wait times. I definitely recommend using these apps! Riding the teacups with no wait and hardly any other people. In JULY! 4. Get some of your fun stuff BEFORE you get to Disney. We saved money by making our own autograph books for the kids before we left. I bought little photo albums at the dollar store and some Disney stickers (Dollar Tree too) and customized a cover for each kid's book with their name on it. Then I hot-glued scrapbook paper to alternating pages in the book (on top of the plastic that you slide the photos into) and put some stickers on the scrapbook paper pages in the corner. These were the pages that the characters signed, and alternating them with empty pages in the photo album gave us a place to put a photo of them with each character they met. I wasn't sure they would care so much about meeting the characters, but they couldn't get enough of it. It was one of the most precious parts of our trip, I'm really glad we made time for it... And I'm really glad I didn't wait till we got to Disney and have to pay $15 a pop for their autograph books. We also ordered a set of Disney trading pins on ebay and divided them between the kids, so they could put them on lanyards and trade pins while in the park (a fun little Disney thing that's new since the last time I visited 5 years ago). We bought Disney lanyards at our local party store for $1 each, but were disappointed when we discovered that the pins fell off these lanyards WAY too easily. We ended up buying new lanyards in the park (a splurge) and the pins stayed on much better (though there were still a few that didn't seems to ever want to stay on)! Weird. 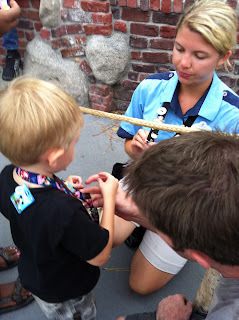 But the kids enjoyed trading with Disney cast members as we toured the parks. They probably didn't enjoy it as much as they enjoyed the autograph books though. Pin trading. Cast members will always trade with you, up to two pins. I know some people buy Disney souvenirs at Disney outlets and dollar stores and such before their trip and then give their child a souvenir each day of vacation without spending the big bucks on souvenirs in the parks. A great idea! We didn't want to create the expectation in our kids that they need to get something everyday of vacation. Instead, we put their lanyards, autograph books, some pens, a Mickey stuffed animal, and a few small trinkets in a gift bag and left them out for them to find the first morning of vacation. The rest of vacation we had clear guidelines on what we would and wouldn't be spending in the parks, and the kids had their own spending money they had saved up and brought along to use. This worked great for us. 5. Get to the parks at opening. I had my doubts, but it's true what everyone says, you will get on tons of rides with hardly any wait at all if you get there when the park opens. We visited at the end of July, which is one of THE busiest times of the year to visit, but we hardly waited in any lines. No lie. It felt too good to be true. It really wasn't till about lunch time when lines would start to get longer, and by that point we had already had a solid 3 hours of riding stuff line-free! You don't have to be one of those crazy people, pushing your way through the crowd and sprinting to get to the rides first. Just be somewhere in the crowd at opening and you'll be golden. 6. Utilize Fast Passes and Rider Share! Be sure to get a new Fast Pass as soon as your previous Fast Pass allows you to (which is usually only about an hour or two after you get it, even if you have to wait longer than that to use the fast pass). Send one person into the park with everybody in your group's tickets. Let them run ahead and get Fast Passes and then meet up at the first ride you all want to go on. You only ever need to send one person in your group to get the Fast Passes. 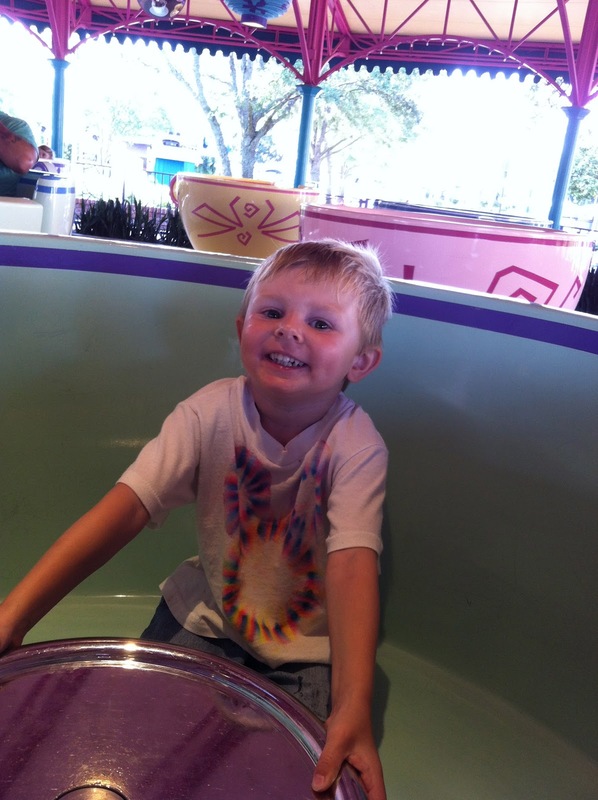 Rider Share allows you to get a Fast Pass for 3 people in your group for a ride or attraction that a child in your group is too little (or too scared) to ride. The idea is that someone waits with the child while the rest of the group stands in the stand-by line for the ride. Then when they get off, you can use the Fast Pass for the person who waited, plus two other people in your group, to get on the ride without having to wait in the stand-by line again. This helped our big kids get to go on some rides multiple times with no wait. I'll admit, we milked the Rider Share thing and this cut down on our wait times in a big way! It felt like we always had a Fast Pass or a Rider Share and never had to wait in any lines (it helped to be able to check-off a lot of our must-dos early in the day when there were pretty much zero lines)! I think the only big line we waited in all week was to meet Buzz and Woody, and that was because it was a spur-of-the-moment decision by the kids, and there was no Fast Pass on that. 7. Stay at a condo near Disney. 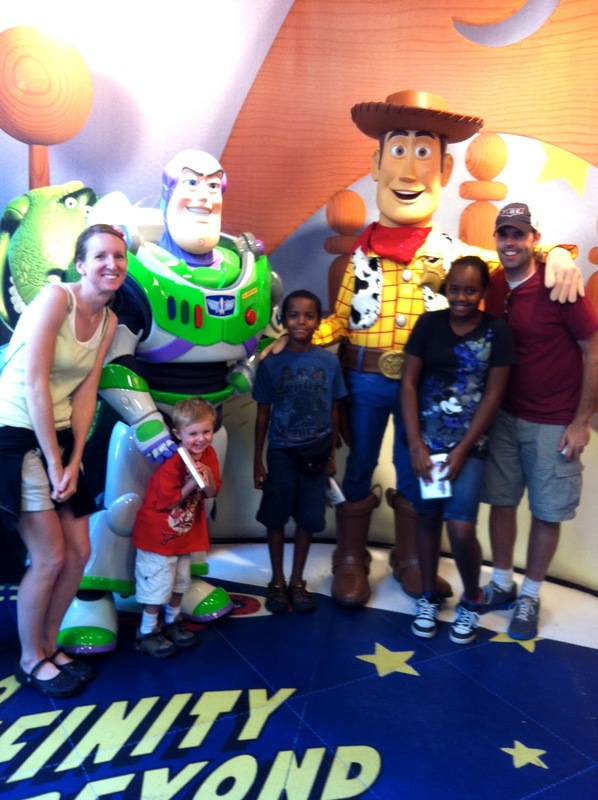 We have never stayed on property, and have always immensely enjoyed our Disney vacations. I'm sure on-property vacations are awesome, but if we're thrilled already with a non-property lodging option, why raise the standard and price tag of our vacation unnecessarily, right? Ignorance is absolutely bliss in this case! We rented a very affordable, three-bedroom condo that was literally right down the road from Disney. It took us only a few minutes to get back and forth from Disney. We had plenty of room to spread out (the kids had a room, Hubby and I had a room, my mom had her own room). There was a fantastic pool, waterside, and playground at the resort where our condo was, although we ended up barely using any of that. There was a full washer and dryer so we could pack light and didn't have tons of laundry to do when we got home from our trip. And most importantly, it had a full kitchen! We saved tons of money eating breakfast at home each morning before we headed to the parks. And we usually packed a lunch to bring into the park with us, and/or came back to our condo to cook dinner. So we usually only ever ate a maximum of one meal out each day, sometimes none! 8. Bring a lunch into the park, as well as plenty of drinks. Did you know you can bring a soft-sided cooler into Disney? You can! We brought two coolers each day; one for our lunches and munchies, and one for drinks. We would freeze juice boxes and water bottles (Gogurts too!) and so we always had plenty of cold refreshments throughout the day. And bringing munchies saved us money and avoided meltdowns in those moments when the kids would suddenly utter, "I'm hungry!" And we discovered that finding a bench or table in the shade and unpacking our own lunches was much easier and more relaxing than battling the lines and crowds in the restaurants at meal times. Plus, we found that most of the restaurants in the parks had pretty limited menus (like only pizzas in one restaurant, or only chicken in another), and so packing our own lunch was more of a guarantee that everybody would be pleased with what they ended up eating. 9. Know when to leave. There was only one day that we stayed at the park the entire day. The other days we usually headed back to our condo in the late afternoon to cook dinner and get to bed at a reasonable time. It was never a battle with the kids, because by getting there at opening, we had plenty of time to go on everything they wanted to go on (and more) by afternoon. Still, they were thoroughly EXHAUSTED even with leaving the park early. I think on our next trip we will plan a longer stay and work in more rest days, or just plan less days at the parks so we can work in more rest days. 10. Sanitize! We did not make a point of doing this well. And I think all the germs at Disney, coupled with not enough sleep while on the trip, and grueling days at the park, was why we ended up with two sick kids in the car on the way home. I have heard from several other people since that their kids were sick by the end of their Disney trip as well. I don't know if sanitizing our hands better during the trip would have helped avoid this, but it couldn't have hurt. Maybe upping your vitamin in-take for the week preceding your trip, the week of your trip, and the week after your trip might help your kids avoid the sickies too. It wasn't a fun way to end the trip, but they did OK with the car trip (it was actually a pretty quiet trip home) and we all felt the trip was still awesome, despite the sickies at the end. 11. Bring Grandma with if you can! Ha! My mom came along on our trip and it was so fun having her there. Logistically juggling the various wants and needs of our three kids (each 4 years apart in age) was much easier with another adult there. And I loved getting to spend time with her all week, since we live eight hours away from each other. She let David and I have a date night at the Magic Kingdom one evening, and a movie date night another night. And then David let her and me have a girls' night out together at the Magic Kingdom on another night. So special! 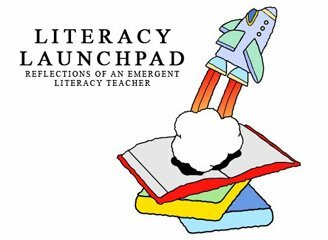 Want more Literacy Launchpad fun and goodies? Visit us on Facebook, Twitter, and Pinterest! Leave your questions in the comments and I'll do my best to answer them and help you out further if I can! These are great tips. We travel on a tight budget as well. When we have gone before our kids were toddlers and we had the stroller to coral all the bags, etc. What do you do with your lunch coolers, etc when you bring them into the park? We keep our coolers in the bottom of our stroller (we bring a couple smallish ones), Amy. Some people put theirs in a locker, but I don't like the hassle of having to go fetch it when we want to eat. Ha!